52 Mantels: Modern Artwork from Kid's Art! Modern Artwork from Kid's Art! 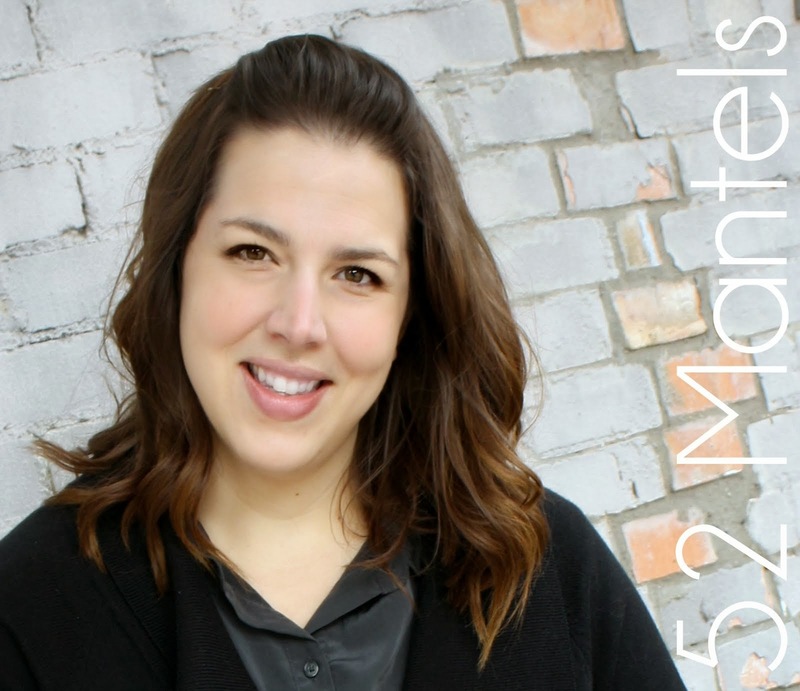 If you have toddlers and like to do creative projects, you've probably dealt with unwanted "help" from little hands. My daughter loves to paint and draw and glue and cut and...help momma! And, sometimes it's nice to plan projects around her help, instead of waiting for nap time! 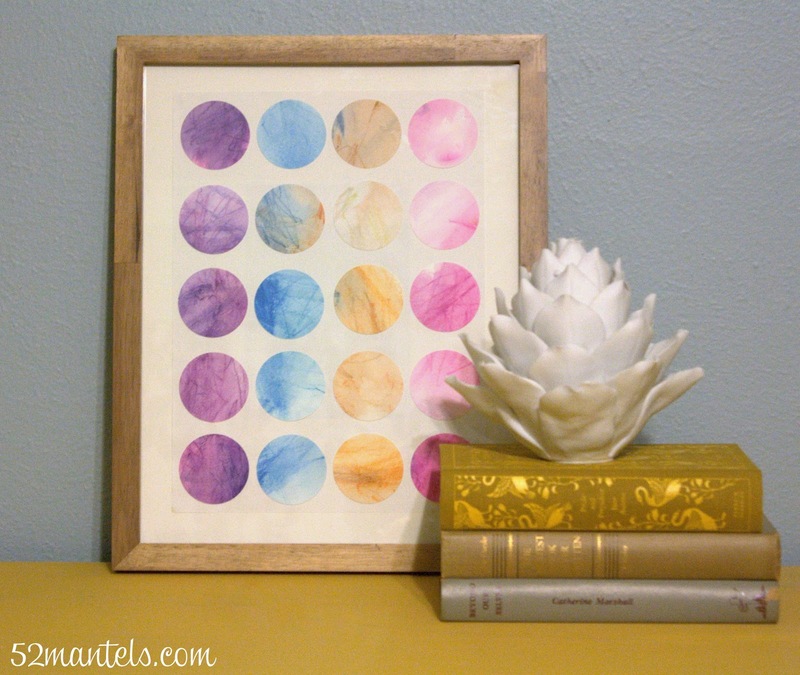 This Modern Watercolor Art project was one of those plans. We worked together and ended up with a beautiful bit of home decor! 1) Lay out watercolor paper and pencils. Let child do her thang. 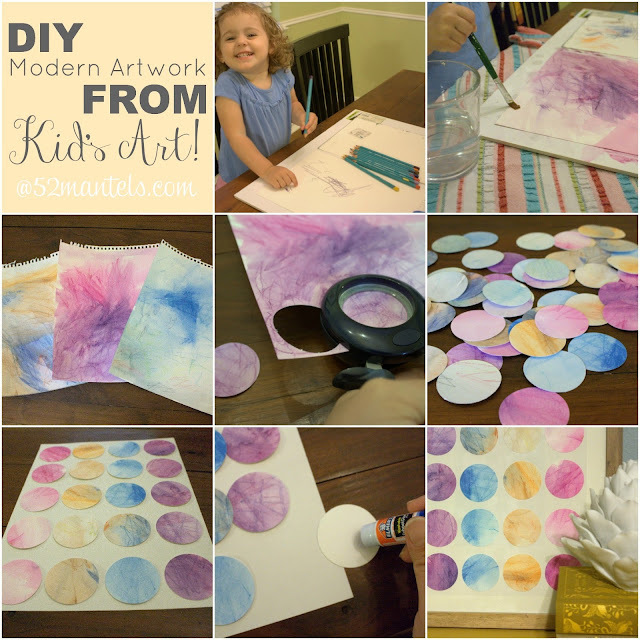 2) after she's created her art with the pencils, let her "paint" over the pencils with water and a paintbrush 3) let the artwork dry completely 4) use the 2" circle cutter and cut as many circles as possible from each page (I got 20 circles/page). 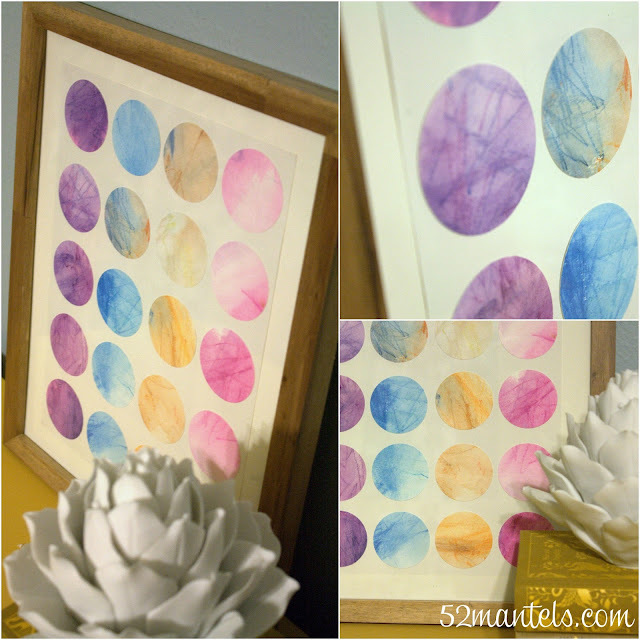 5) grab your 9x12 paper and arrange the circles in your pattern of choice (random would also be fun!) 6) use a glue stick to attach each circle in place 7) frame the artwork and display! I chose to mount our artwork on top of mat board for a modern look. Do you love to create with your little helpers? My daughter is crazy about painting...and, you know what? I love it too! Need a few more Kid's Art ideas? How adorable is this! My daughters' both LOVE to help mama paint too and this would be such a fun project to do with them. Thanks for sharing, happy Friday too :). 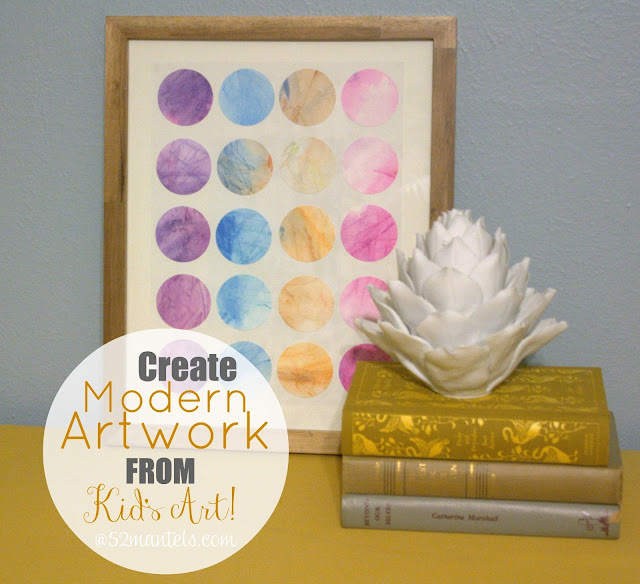 What a great way to decorate with a project that involves your kids as the artists! Thanks for posting this idea! Hi Em, your daughter looks like she is adoring all the paint and fun with you. Such a great time...and the memories! What a little doll. Your little one is so sweet and adorable, that smile and curly hair, she's for cuddling. Enjoy her while she's little. Glad she's a good helper, love to create art. Your art turned out very nice, love it. 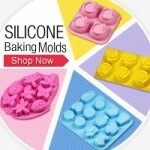 Easy and pretty and a shared experience with your little sweetie. What more could a day offer? Have a wonderful holiday weekend. Thanks! I think she's adorable too (but, you know, I might be biased) :). Emily, I LOVE this! I need to do this with LC's art! Can I beg you to link this up at Shine on Fridays, puh-leeeeease? Thanks Amy!! 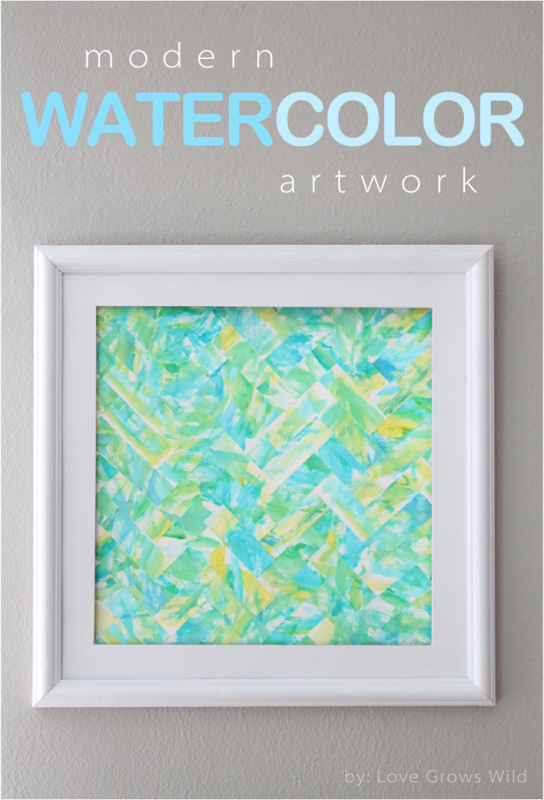 Definitely try this with LC's artwork! I'll swing by to link up! Thanks for the invite! So adorable!! 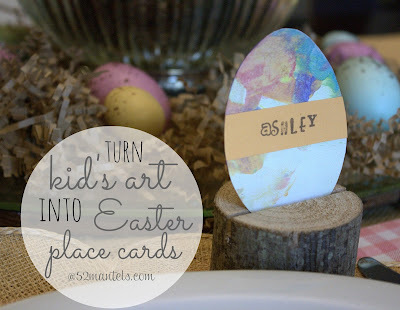 What a fun project for the kiddos to do. Pinning it!! Ok, this is adorable. I love the modern spin you put on it. Definitely frame and display worthy!